Eco-philosopher and best-selling author Joanna Macy, Ph.D., shares five stories from her more than thirty years of studying and practicing Buddhism and deep ecology. Gathered on her travels to India, Russia, Australia, and Tibet, these stories give testament to Joanna Macy's belief that either humankind awakens to a new and deeper understanding of our interconnectedness with our planet and all its myriad forms of life or risks loosing it. To bring about such a transformation of consciousness each and every one of us counts. 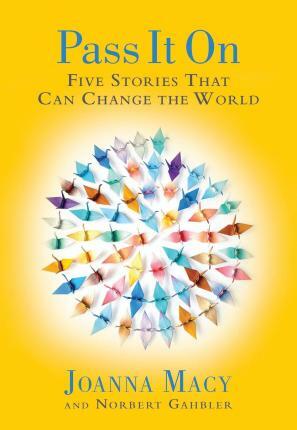 Five Stories that Can Change the World tells of encounters with individuals who share very personal stories of sudden awakening, unexpected awareness, and the co-mingling of joy and pain. Each story is imbued with the specific cultural flavor of the places where the stories originate, but all share that each individual counts in the global need for change and awakening. Pas It On provides an introduction to Joanna Macy's work of "deep ecology" and "the great turning" and the deep interconnected nature of all beings.Introduction by Norbert Gahbler. Eco-philosopher Joanna Macy, Ph.D., is one of the best known spiritual activists. She is a scholar of Buddhism, general systems theory, and deep ecology. A respected voice in movements for peace, justice, and ecology, she interweaves her scholarship with four decades of activism. Her wide-ranging work addresses psychological and spiritual issues of the nuclear age, the cultivation of ecological awareness, and the fruitful resonance between Buddhist thought and contemporary science. Her group methods have been adopted and adapted widely in classrooms, churches, and grassroots organizing. Her work helps people transform despair and apathy, in the face of overwhelming social and ecological crises, into constructive, collaborative action. The author of 10 previous books Macy travels widely giving lectures, workshops, and trainings in the Americas, Europe, Asia, and Australia. She lives in Berkeley, California. Norbert Gahbler is a member of the board of directors and a coach in Germany's Society for Applied Deep Ecology. He works closely with Joanna Macy, and has translated and co-authored several articles and one book with her.